Like many cheesy holiday movies, it feels like it was written pun-first, with a plot developed by way of reverse-engineering. In the spirit of the holiday season, Pittsburgh City Paper presents a holiday movie advent calendar. One holiday movie review, every day 'til Christmas (today). Thanks for reading. It's over now. It had to end somewhere, so why not with a crudely animated great white shark in a Santa hat? The SyFy original movie Santa Jaws, like many of the films CP reviewed for the Holiday Movie Advent Calendar, feels like it was written pun-first, with a plot developed by way of reverse-engineering. But in this case, the filmmakers pass the credit for the title to the movie's protagonist. Santa Jaws is the name of a comic book series written by teenage outcast Cody (Reid Miller) about the aforementioned Great White. Cody has greasy hair and wears a sweatshirt. He spends most of his time talking comic books with his best friend Steve (Hawn Tran) at the local comic book store. Right before Christmas, Cody gets grounded for drawing a crude cartoon at school and, in Kevin McAllister fashion, wishes to be alone on Christmas. In his anger, he writes a vengeful new Santa Jaws issue with a magic pen given to him by his grandfather Joseph, who goes by Papa Joe (Ritchie Montgomery). Dumb move. Don't go to sleep angry and definitely don't write comics with a magic pen angry. Santa Jaws comes to life. The next morning, Papa Joe wakes Cody up to go fishing. Papa Joe is very nice, the kind of guy you just want to see not get eaten by a shark. 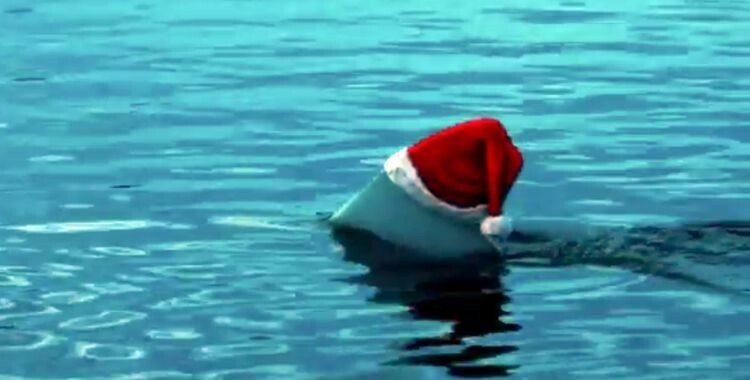 But to the marina they go, where we first see the real Santa Jaws. The shark is CGI when breaching, but adorably portrayed by a prop fin when on the hunt. The thing has red eyes (like Rudolph's nose) and wears a Santa hat on its dorsal fin, which made me wonder if there was one of those "if a dog wore pants ..." arguments in the writers room. Thanks to Cody's irresponsible comic-writing, Santa Jaws is hellbent on killing his entire family. The bulk of the film follows Cody, Steve, and a cast of supporting characters as they try to kill the beast and protect family members from shark-related death. There's Jena, a cute girl-next-door type who lives next-door; Cody's brother and parents; and his aunt Georgia and uncle Mike. Georgia is a Snapstagram model/influencer (yes) with over 100,000 followers, Mike owns a boat and a captain's hat. They are by far the most entertaining characters in the film, with lines like "OMG my pores look terrible" and "You just stay here looking hot." I watched Santa Jaws while wrapping presents, which is ideal. I saw the title while scrolling the menu and said, "yes, that'll do." Like many Hallmark/Lifetime movies and other SyFy creations like Sharknado, there are no veiled intentions in Santa Jaws. It's deeply stupid, knows it's stupid, knows you know it's stupid, knows you know it knows etc ... That sort of self-awareness makes writing a critique as irresistible and pointless as the films themselves. It's like reviewing American cheese. It is what it is. But just because it's stupid doesn't mean it's easy, and Santa Jaws nails the formula. When it's good, it's delightful. When it's bad, you can always just go back to doing whatever else you're doing. It asks so little and gives so much. Thanks, Santa Jaws. Thanks for reading CP's Holiday Movie Advent Calendar. It was a journey for us all.